As we evaluated the lots from the 2011 vintage prior to assemblage, this particular vineyard lot of Merlot stood out. It was so impressive, we chose to feature it on its own for Premiere Napa Valley. This 100% Merlot displays bright fruit with plum, black olive, tobacco, toasted oak and minerality. The mouth is rich, but with a nice, vibrant acidity, and flavors of dark cherries, blackberries and mocha. Drink over the next 3-7 years. Chris grew up in a large Greek family, His grandfathers made wine, his father sells wine, so naturally he thought that someone in the family should do both. After graduating with a Plant Ecology degree, Chris went on to study Viticulture & Enology at UC Davis. In 1995 he went to work for Pine Ridge Winery in Napa as their enologist, mainly making Cabernet Sauvignon, Merlot, Chardonnay and, of course, Chenin Blanc. 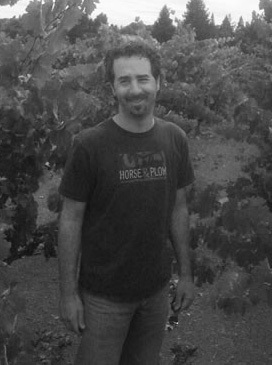 Currently Chris is a winemaking consultant for Kathryn Kennedy Winery in the Santa Cruz Mountains, and recently started a new brand called Horse & Plow. Education: After graduating with a Plant Ecology degree, Chris went on to study Viticulture & Enology at UC Davis. years, he has skillfully crafted Lateral, bringing out the greatest harmony possible from the traditional varietals.